Ilwad Elman has 5 years of experience working on Human Rights, Gender Justice, Protection of Civilians and peacebuilding in Somalia. Currently, she serves as the Director of Programs and Development at a nationally-scoped, non-profit & Non-Governmental Organization in Somalia: the Elman Peace and Human Rights Centre. The organization works in all areas of human rights, with Ilwad’s key areas of focus being the socio-economic reintegration of children and youth disassociated from armed forces and groups, as well as the support of survivors of sexual and gender based violence. In addition to her work with the organization, Ilwad leads various coordination groups in south and central Somalia with members consisting of local and international NGOs, UN agencies and Government officials and researchers. These groups are designed to improve service delivery amongst the vast number of humanitarian actors, strengthen their referral and cooperation system, enhance information sharing, ensure civil society’s initiatives are in cohesion with the federal government’s action plans, and ultimately complement the greater objective of a coordinated social good in Somalia. To this extent, Ilwad chairs the child protection working group in Afgoye, Lower-Shabelle, the Gender Based Violence Case Management group in Mogadishu, co-chairs the Child Protection working group in Mogadishu alongside UNICEF, chairs the Street Children Task Force in Mogadishu, chairs the Practitioners’ Network for Civilian Casualty Recording and serves as the Special rapporteur for the Civil Society Human Rights Universal Periodic Review Action Group. Ilwad completed the Mandela Washington Fellowship, a flagship program of President Barrack Obama for Young African Leaders in 2014. In the same year, she was appointed Ambassador to Somalia for Youth to End Sexual Violence. As a social activist, Ilwad organizes TEDx events in Somalia (Technology, Entertainment, and Design) and in the spirit of the TED mission and under her leadership, the internationally acclaimed annual event has been successful in bridging the gap between local Somalis and the Somali Diaspora with Ideas Worth Spreading. In continuity of her global outreach and international platforms, Ilwad was invited to brief the UN Security Council in New York at the annual thematic debate of Protection of Civilians in 2015. The delivery of her statement to the council marked an important milestone, as civil society was invited to speak before the council on the POC debate for the first time. Ilwad envisions a Somalia where youth and women are decision makers in the processes that ensure their wellbeing and a world where they are free to define the scopes of their own lives. 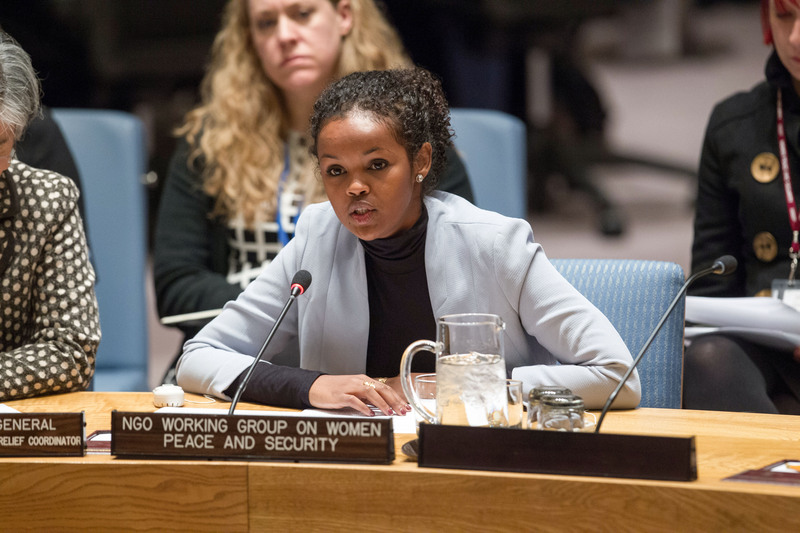 Ms. Ilwad Elman was selected to represent civil society and spoke on in her capacity as Director of the Elman Peace and Human Rights Centre in Somalia, and on behalf of the NGO Working Group on Women, Peace and Security at the United Nations Security Council Open Debate on Protection of Civilians.